Here are multiple stories of how Mennonite Central Committee (MCC) began. One tells of Clayton Kratz, a young man who went to Russia, Ukraine and Turkey, to attempt to distribute aid to starving people in 1920, but disappeared and was never found. Another details how Mennonites worked with the U.S. government to finally deliver relief supplies beginning in 1922. For some people, MCC started when Peter J. Dyck, who was saved from starvation by that aid, and his wife Elfrieda Klassen Dyck led Russian Mennonite refugees out of Europe after World War II. People connected to MCC in countries around the world each have a tale of how they were introduced to the organization. About 130 people gathered in mid-June at the “Table of Sharing” conference to tell some of the stories from MCC’s first 90 years. Conference presenters showed how MCC has shaped Mennonite identity as it has fostered cooperation among Anabaptist groups doing relief, development and peacebuilding, as well as representing Mennonites around the world. They described how MCC has contributed to creating other initiatives and has been at the forefront of work against racism and sexism, even as it has at times also embodied inequalities. MCC receives broad support from Mennonite Church U.S.A. and the Brethren in Christ (BIC) members, reported Donald Kraybill, a sociologist at Elizabethtown College, Pa., from 2006 survey results. In MC U.S.A., 96 percent of respondents strongly supported MCC’s mission. In the BIC, 92 percent did. By contrast, only 79 percent of MC U.S.A. respondents were satisfied or very satisfied with MCC’s program and emphases. In the BIC, 68 percent of people responded similarly. The survey did not measure the reasons for respondents’ perceptions. Despite such support, the groups participating in MCC do not always have consensus on issues of relief and advocacy. Ken Sensenig, MCC East Coast assistant director and liaison to American plain groups, described how the Amish have contributed funds, material goods and other forms of support. Yet they usually are not mentioned in descriptions of the organization and have not had prominent roles, although they are on the East Coast board. 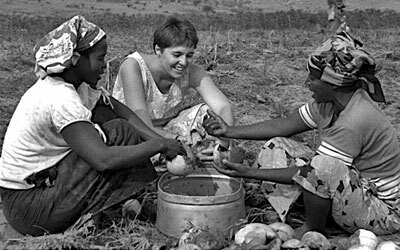 MCC has been involved in creating new entities, including Ten Thousand Villages, one of the world’s largest fair trade organizations; the “World Community Cookbooks,” with resources for ethical eating; and Christian Peacemaker Teams (CPT), which seeks to reduce violence by sending trained people into conflict zones. Peacebuilding should remain a priority for MCC, said Johnson Gakumba, Anglican bishop in the diocese of northern Uganda, during a panel giving views of MCC from work on the ground. “There is no development without peace,” Gakumba said. “You can build bridges, you can build schools, you can pay school fees, but if tomorrow they are going to be wiped out, you are wasting your time. Zemedkun Baykeda, former director of the Meserete Kristos (Christ is the Foundation) Church Relief and Development Association in Ethiopia, would like to see MCC collaborate more with Eastern Mennonite Missions. This would model a “more holistic approach” to meeting people’s physical and spiritual needs, which many church leaders currently separate, he said. 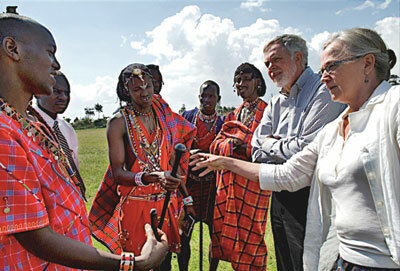 “That dichotomy between the development program and spiritual program is increasing,” Baykeda said.